Here's a simple light table activity that I set up for the boys. This activity worked on fine motor skills as well as color recognition and matching. It was simple to set up and used items found at the dollar store. 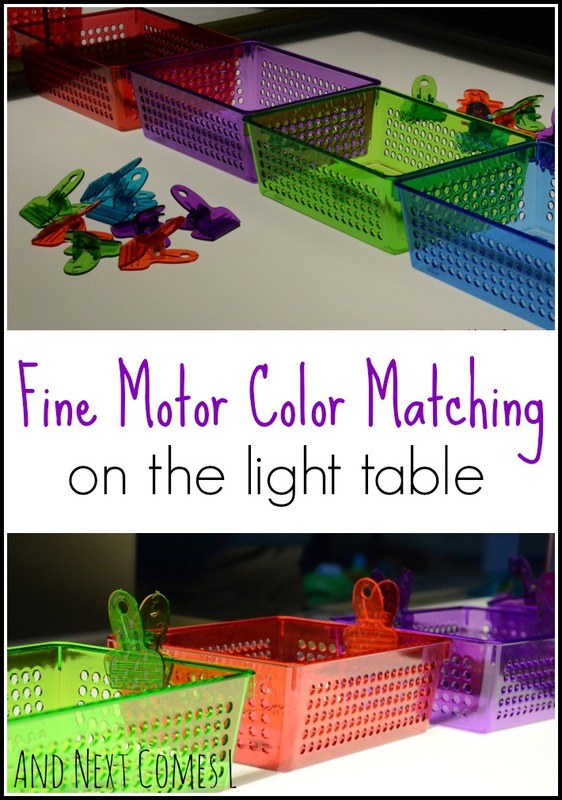 For this light table activity, I set out translucent colored plastic bins and translucent colored chip bag clips in matching colors. The clips are a bit challenging for toddlers to open on their own initially, but after a few minutes of practicing, K quickly mastered opening the clips. As you can see, the clips are great for developing fine motor skills. The goal was to match the clips to their corresponding bin in the same color, which K did without prompting from me. Ha! This kid totally cracks me up! You know how much I like all lightbox activities! ;) This one is great - simple and help child practice basic skills. These baskets and pegs seem perfect for lightbox. They really are perfect for the light table! And yes, you and I are like two peas in a pod when it comes to light play and felt! MY goodness how fun that looks!